A young boy learns the meaning of new life when the wife of the owner of the local candy store shares with him the symbolism of the Easter egg, telling the hope-filled story of Christ's resurrection. 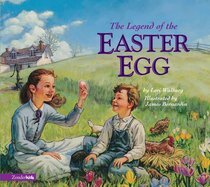 About "The Legend of the Easter Egg"
One April morning, a boy and his sister go outside to gather eggs. "Let's pretend we're hunting Easter eggs!" Lucy says. "What are Easter eggs?" Thomas wonders. In The Legend of the Easter Egg, young Thomas learns the deeper meaning behind Easter eggs and the Easter story itself. When his older sister Lucy falls sick, Thomas goes to stay with John and Mary Sonneman at their candy store. But all the candy he could desire does not cure Thomas's aching heart. Only when Mary Sonneman shares with him the story of Easter does he understand the hope he has -- and what he can do about his sister's illness. Featuring the beloved setting and characters from the best-selling Legend of the Candy Cane, this moving story takes us deeper into the mystery of Christianity. Dramatic illustrations by James Bernardin underscore the chilling fear of separation and death -- and the dazzling joy of reunion and new life. Lori Walburg attended Dordt College and graduated from Calvin College and the University of Iowa. Lori is the author of the best-selling The Legend of the Candy Cane and The Legend of the Easter Egg. She lives with her husband and 2 children in her hometown of Grand Rapids, Michigan.